Sarah Bowling and the Saving Moses Team are in FORBES Magazine! Check out the amazing work of Sarah and the Saving Moses Team in this recent article of national and international exposure from FORBES Online Magazine. Forbes is one of the most respectable and widely read magazines in the world and Sarah is a member of the Forbes Nonprofit Council. Eighty-six-year-old evangelist Marilyn Hickey is still following the move of God, this time in Mongolia. In May, Hickey took 75 people with her to Mongolia and China to preach the Word and see the Holy Spirit pour out among all flesh in an area that was previously bound in religious chains. 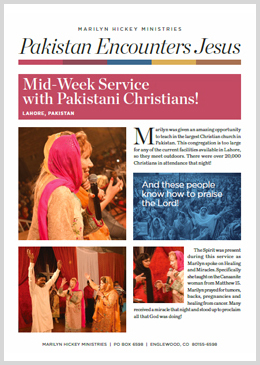 Marilyn was given an amazing opportunity to teach in the largest Christian church in Pakistan. This congregation is too large for any of the current facilities available in Lahore, so they meet outdoors. There were over 20,000 Christians in attendance that night! Click here for more on this amazing event! 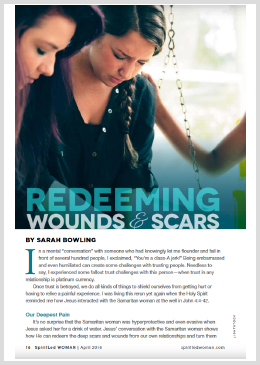 Check out Sarah Bowling is in the April 2016 edition of the Spirit Led Woman Magazine! 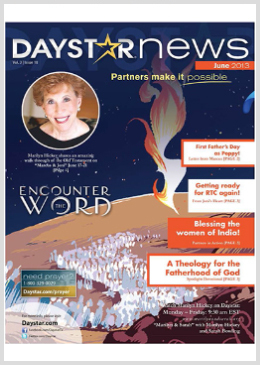 MARILYN HICKEY IS FEATURED ON DAYSTAR’S JUNE 2013 NEWSLETTER! For more information about this trip and other Marilyn Hickey Ministries opportunities, visit our Events Calendar. 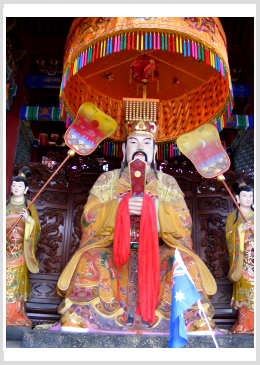 Marilyn Hickey Ministries will be taking a group of more than 100 travelers on a ministry trip to China from May 8th to May 20th, 2013. Marilyn Hickey, leading Christian educator, announces the Marilyn Hickey Ministries’ Trip to China this May. Marilyn Hickey will take a group of more than 100 travelers on a ministry trip to China, May 8-20, 2013. This will be Marilyn’s 34th visit to China, where she will be ministering to seminary students and Christians at government-approved churches in three cities: Guangzhou, Shanghai, and Hangzhou. In addition to ministering to the Christian population in China, the group is eager to be immersed in Chinese culture. They will visit the Bund, a historic waterfront area of Shanghai, the famous Yu Garden and embark on a scenic cruise down the Yangtze River from Chongquing to Yichang through the Three Gorges Dam. The Yangtze is the longest river in China and one of the most majestic rivers in the world. The group will also have the opportunity to visit the Chen Ancestral Temple and Sunzhongshan Memorial Hall, as well as many different colorful marketplaces along the way. Marilyn Hickey is a devout ministry leader who has dedicated more than 40 years of her life to spreading the Word of God. Marilyn has traveled to more than 120 different countries holding a staggering amount of international meetings and group tours. Her television program, Today with Marilyn and Sarah, is broadcast in more than 130 countries. In 2012, Marilyn held Pakistan’s largest ever religious gathering with more than 400,000 attendees. For more information about this trip and other Marilyn Hickey Ministries opportunities, visit Our Events Calendar/. For more than four decades, Marilyn Hickey has made it her mission to bring people into a relationship with Jesus Christ. 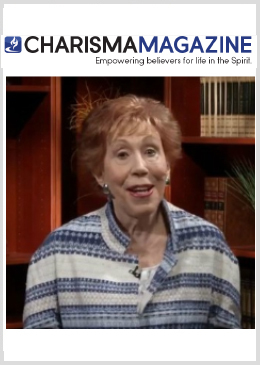 Her international organization Marilyn Hickey Ministries sends a clear message of love, hope and healing to people around the world through Bible teaching, international healing meetings, group ministry tours, pastors’ and leaders’ conferences, humanitarian efforts, and the daily television program, Today with Marilyn and Sarah. To learn more call (888)-637-4545 or email us at: traveldesk@mhmin.org. Karachi, Pakistan, the 10th largest city in the world and the largest Muslim city in the world, is the most dangerous city in the world (Time Magazine, January 16, 2012). Dr. Marilyn Hickey, a bible teacher out of Colorado, is helping to change this by bringing God’s healing and love to this nation. Dr. Hickey has been working with various political, religious and ethnic groups in Pakistan for over 16 years building bridges of friendship and cooperation with all religions and races of the Muslim, Hindu and Christian faith. 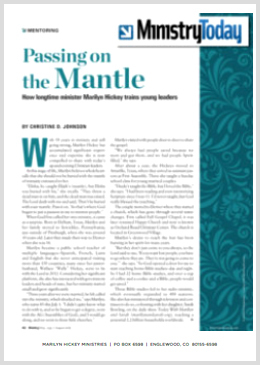 Her recent, sixth-trip turned out to be one of the most successful in Marilyn’s 40-plus year history of international ministry. A record number of people attended the three nights of healing meetings at the Karachi YMCA compound. By the third night, the attendance was up to 200,000 while the streets leading to the compound had to be shut down as thousands were positioned outside the ground’s walls watching the event on large screens. Multiple healings were reported, including a Muslim man who was paralyzed can now walk and a little boy blind from birth can now see, and captured on video. High-Government officials supported Dr. Hickey’s meetings. Senior advisor to Pakistan’s Prime Minister, Dr. Paul Bhatti, thanked Dr. Hickey for praying for the physically sick but also for healing from illiteracy, poverty and terrorism. Governor Sindh Dr. Ishrat Ul Ebad Khan, who was very instrumental in securing the required permissions from the Pakistani government for this historic event, invited Marilyn to his home to pray for his family. The group joined hands and prayed for Pakistan, Karachi and the duties of his office. Dr. Hickey was also invited to a special luncheon with the leaders of the MQM party, the third largest political party in Pakistan, where she prayed for healing for each person and handed them her latest book, Pathway to Miracles. Dr. Hickey and her team were greeted at the Karachi Airport by several hundred local leaders who showered her with traditional flowers, six local television stations that interviewed her about her visit, and a band. 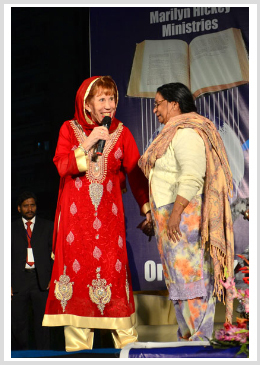 Evangelist and Bible teacher Marilyn Hickey believes in modern-day miracles through God’s healing power and shared with The Christian Post her latest prayer initiative in Karachi, Pakistan, which exposed over 400,000 people to Jesus Christ. Karachi is one of the largest – with an estimated 18 million residents – and most dangerous cities worldwide. The metropolitan has seen long-standing ethnic, political and religious tensions within sects of its population. Regardless, Hickey, a Colorado resident, shared that the January trip was her sixth visit to the predominantly Muslim nation. The 80-year-old told The Christian Post that she had been traveling to Pakistan since 1995 and has a “great heart” for the people. According to Hickey, her healing meetings draw huge audiences, with about 75 percent of them Muslim attendees. She explained that she first teaches about one miracle of Jesus – sharing his healing power. 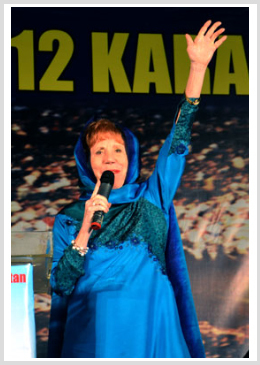 Click here to continue reading the article “Marilyn Hickey’s “Night of Healing” Rallies Over 400,000 in Pakistan”. Indeed, Hickey has been working with various political, religious and ethnic groups in Pakistan for more than 16 years building bridges of friendship and cooperation with all religions and races of the Muslim, Hindu and Christian faith. 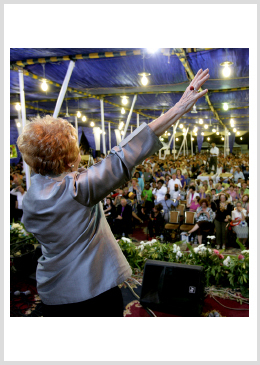 Hickey’s recent sixth trip was one of the most successful in her 40-plus year history of international ministry. A bridge by definition connects two adjacent elements to form one unified entity. Worldwide, people often forget about the bridge that fundamentally connects us; it is that we are all a part of mankind, the human race. Because the suffering of mankind from poverty, violence, racism, and deficiency is counteractive to the philosophy of a bridge, Marilyn Hickey Ministries is predominately focused on positively affecting negative circumstances in countries across the globe. At the heart of the organization lies the desire to connect people of all cultures, backgrounds, and religious beliefs with understanding, education, and humanitarian acts in order to benefit mankind. Marilyn and Sarah have been granted personal audience with high ranking government officials throughout the world. The First lady of Cambodia, Bun Rany The First Lady expressed her gratitude for their generous six ton gift of rice donated to Cambodia’s poorest families. On one of her many visits to the Middle East, King Abdulla II of Jordan joined Dr. Hickey in a private audience. In Ethiopia, Marilyn was granted a private audience with President Girma Wolde-Giorgis and Sarah with the governor of Gondor for their humanitarian efforts within the country. In 2008, Dr. Hickey received a gift of recognition while in Egypt that only presidents and dignitaries receive and her healing meetings in Cairo were the largest gatherings on spirituality in the country’s history to date. Marilyn Hickey and Sarah Bowling are no strangers to working within various cultures. Their efforts to empower people from all backgrounds are heartily recognized by many countries, political, and religious leaders. Marilyn was once honored to be a keynote speaker at an Interfaith educational gathering in Dearborn, Michigan, the Muslim capitol of the United States. Among the group invited were a Jewish Rabbi, a Muslim Imam, a Catholic Priest. This experience was the physical actualization of the mission of Marilyn Hickey Ministries; connecting two things that were once separate: bridging our world together. Marilyn Hickey ministries has made a dramatic impact on many countries worldwide; from disaster relief efforts in Haiti, Indonesia, and Pakistan to providing food for the hungry in Mexico, Costa Rica, Russia, and Manila. Marilyn has expressed great desire in uniting people together and where there is need, there is a call to respond. With a true humanitarian’s heart, Dr. Hickey has helped millions of individuals overcome setbacks. Dr. Hickey is also a highly sought after international public speaker and her lectures on healing and the Bible have broken records in several countries for the largest public meeting ever held in that nation’s history. Saving Moses is an initiative to assist children ages 5 and younger to not only survive, but thrive, giving them the chance to live and flourish by assisting with basic food, water, shelter and medical needs. Saving Moses has been proactive in countries like: China, Costa Rica, Cambodia, Haiti, Albania, and Ethiopia, to name a few and also has an impact on the human trafficking industry. Click here for more information about Saving Moses. 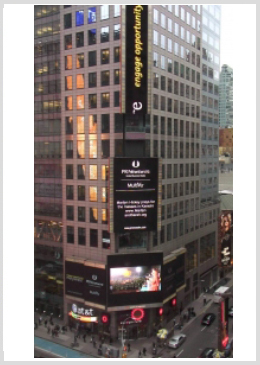 Marilyn and Sarah are frequently invited to speak within the U.S. and around the world. Their teaching has been impactful on individuals, cultures, and countries. At least twice each year, Marilyn and Sarah take a large group of travelers to visit an international country, learn the culture, and explore its history. Recent trips include China, Greece, Turkey, Albania, Morocco, Israel, Egypt, and Italy. For more information about our fantastic Group Tours, click here.